If problems not listed in the table occur or recommended solutions do not work, please contact the service centre. Displays 'E1' The pipe temperature sensor is abnormal. Clean filters and restart. Refer to service centre if issue still persist. Displays 'E2' The room temperature sensor is abnormal. Clean filters and restart. Refer to service centre if issue still persist. Loud Noise The air conditioning is not placed on a flat surface. Put the air conditioning on a flat and hard place (to reduce noise). Compressor does not work Overheat protection starts. Wait for 3 minutes until the temperature is lowered, and then restart the machine. The air conditioning does not work. There is no electricity. Turn it on after connecting it to a socket with electricity. The overflow indicator displays "FL". Discharge the water inside. The ambient temperature is too low or too high. Only use to use the machine within temperature range of 7-35℃ (44-95℉). 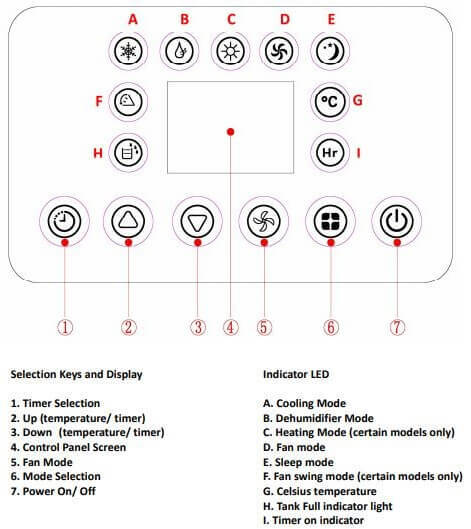 In cooling mode, the room temperature is lower than the set temperature; in heating mode, the room temperature is higher than the set temperature. Change the set temperature. In dehumidification mode, the ambient temperature is low. The machine is placed in a room with an ambient temperature of greater than 17 ℃. (62 ℉). The filter screen is dirty Clean or replace the filter screen. Batteries are dead. Replace batteries. When the internal water tank is full the unit will stop working. Shut off the unit and unplug. Try not to move the model abruptly as this may cause water to may cause the internal water tank to spill out. Place a tray under the water plug or place the unit in a drainage area. Screw off the drain plug and unplug the water rubber stopper – water will drain from the container. Put the water rubber stopper back and screw the drain plug cap back into place. Screw off the drain plug cap and unplug the water rubber stopper. Use a water pipe to connect to the water outlet. You can plumb this pipe into your current plumbing system, lead it outside and use gravity fall or use a water pump. 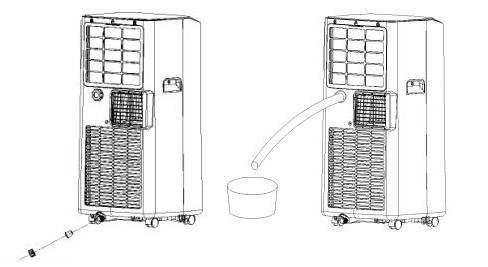 Note: This model has a self-evaporative function, which reduces the need to empty the water tank. If the unit is vented correctly most of the water is reused to cool the condenser coils and any excess is evaporated. Please do not use continuous drainage if you intend to use the self-evaporating facility. 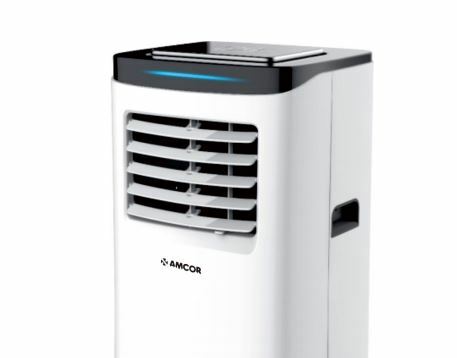 The air conditioner can be controlled via a remote control. Two AAA-batteries are required to use the remote control. This appliance is for indoor use only. Rating: This unit must be only connected to a 220-240 V / 50 Hz earthed outlet. Installation must be in accordance with regulations of the country where the unit is used. If you are in any doubt about the suitability of your electrical supply have it checked and, if necessary, modified by a qualified electrician. This air conditioner has been tested and is safe to use. However, as with any electrical appliances – use it with care. Disconnect the power plug from socket before dismantling, assembling or cleaning. Avoid touching any moving parts of the appliance.